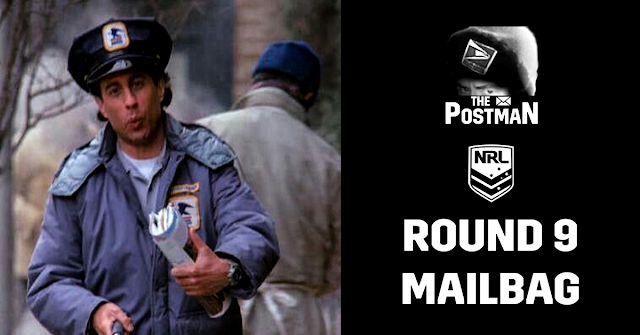 🚨 Sadly the technological hub that is Camden didn't deliver the goods this week - as a full 55 minute NOT The Footy Show Podcast was lost post-recording when the SD Card corrupted... alas the below Postman's Mail will have to suffice in covering the range of topics that NTFS covered in what would have been Episode 166... it means there's no Podcast this week unfortunately. 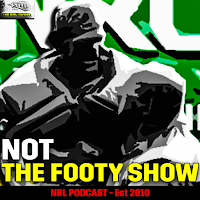 • "Matt Moylan take a bow, he has single-handedly along with some good friends got this game back to where we want to see it..."
"Our game has seen some wonderful redemptive stories throughout its history and I can only think this will be another one." The quote from Mal Meninga above was proof that the only reason Fifita is 'rehabilitated' is because he's needed for Australia rather than wanted... Shannon Boyd, Josh Papalii and Aaron Woods all fell over in the last few days and low and behold - Meninga needed a prop. Fifita's form was better at the back end of last year but the game 'needed to take a stand on behaviour' - so Fifita wasn't picked. Now the Kangaroos need a prop to take on the Kiwis and Meninga's happy to look the other way on Fifita's past (not that he was before) and he's a Kangaroo. But that's not even the most annoying part - and look Fifita will be happy to be playing for Australia again - but he was also used as the poster boy by the NRL for the Pacific Test triple-header in Campbelltown on Saturday (a video since removed due to Fifita's change in countries). Suddenly given the powers that be need him for Australia - having Fifita run out for Tonga is second fiddle city and he'll miss the game. Now he won't change the gate takings for either match but it's disappointing to see how quickly things can change on a number of fronts to suit the powers that be in Rugby League... that all said should he be playing for Tonga anyway? But has their coach? 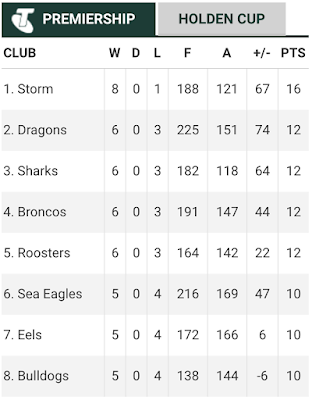 Now Saints got run over royally by Melbourne a week after getting out-grinded by Easts... so that's two losses in a row after a stunning 6-1 start to the season by the Dragons. 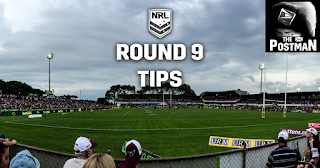 Hayne will be there - NSW Coach Laurie Daley has played his hand and it's the right one and now NSW fans everywhere are hoping and praying he makes Trbojevic his left winger. With Josh Dugan and probably Blake Ferguson installed on the right edge - NSW have a chance to be bold and Hayne is one step in that direction and Trbojevic is yet another if he gets a chance. And based on what we've seen to date - he has to get the chance. James Tedesco will be the fullback and if Matt Moylan gets picked it'll be at 6 or on the bench - so the opportunity is there for Daley to blood Trbojevic and make the team better - not just give a rookie a chance... oh and Hayne is my first NSW player picked ladies and gents. He's that important. Soooooo confident the above won't be your Finals teams... but happily remind me if you need to come September. And though I gave them a wrap above... Saints are no certainties at all. On the Podcast we didn't linger long on the road that City-Country took to eventually become irrelevant but we did point the finger largely at the media for asking for the game to be scrapped for ages... and getting what they want only to call where the game finds itself before its last performance as a pure 'farce'. City-Country was a factor when I grew up but hasn't been for years... from the 'NRL' perspective. But a rep jersey is a rep jersey and all 34 players who will play in Mudgee on Sunday deserve to feel pride in gaining a jersey for the final clash. And to the people of the NSW Country who will go to the game this weekend and have been lucky enough to be part of the host town/region over the years - they know (as I do having been to a few) that the pride of having first grade footy being played at their home ground is just wonderful.